"PLEASE TAKE NOTICE that pursuant to Fed. R. Civ. 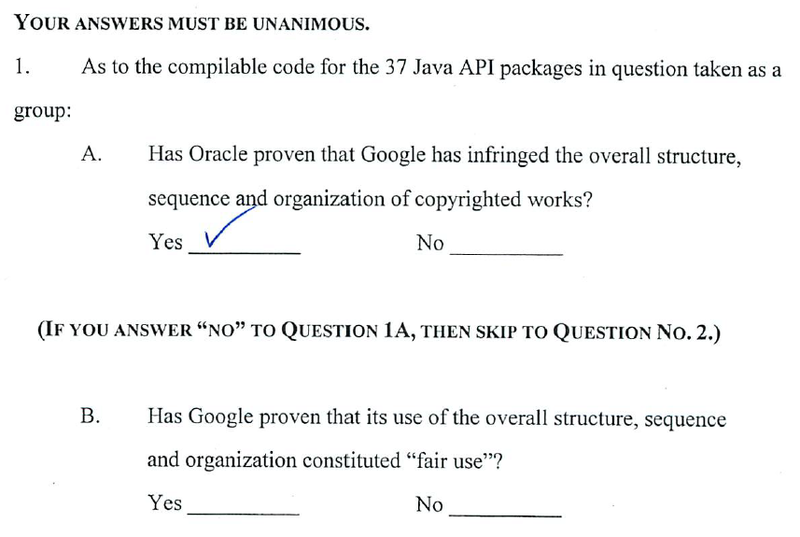 P. 591 Defendant Google Inc. ('Google') will, and hereby does, respectfully move for a new trial on Oracle’s claim that Google is liable for infringement of Oracle’s copyright on the structure, sequence and organization of the compilable code for the 37 Java API packages. This Motion is based on the attached memorandum of points and authorities as well as the entire record in this matter." Near-simultaneously, Oracle filed its response to procedural questions the judge had asked. The parties have yet to comment on each other's position. 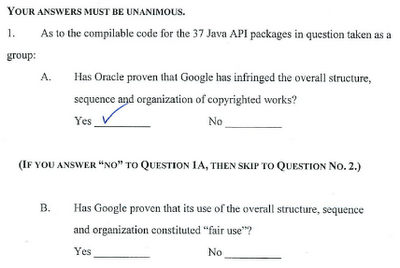 In particular, Oracle's answer to the court's question focused on the issue of disgorgement of copyright infringer's profits with respect to the nine-line rangeCheck function (which is important mostly because it affects the procedural course of action with a view to the "fair use" question the jury couldn't decide) and devoted little more than one page to the question of how to deal with the jury's failure to reach a verdict on Google's fair use defense. 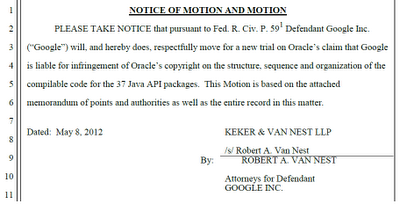 Oracle's response to Google's motion will presumably be far more elaborate. Still, it's now clear which course of action each party prefers: Google insists on a new trial on Question 1 of the copyright trial (so that the infringement question, on which Google lost, gets revisited) while Oracle has a preference for finding a way to make use of the partial jury verdict to the full extent and have the court resolve the "fair use" issue. As you can see above (even without enlarging), the jury checked Yes for infringement and left unanswered the second question on "fair use". This has implications for both parties: Oracle needs to prove infringement (which it did) and overcome Google's affirmative defenses (which it has yet to do), while Google needs to succeed on at least one of its affirmative defenses and has the burden of proof on "fair use" (which it has failed to meet thus far). It's obvious that Oracle desires to keep what it's got, and it's equally obvious that Google has to fight the "infringement" finding with all its might. While those interests are clear, we need to see some further exchange of arguments in order to assess the full extent of the disagreement between the parties. Thus far they have merely tackled the issue from different angles. There's plenty of room for disagreement, and it's possible that they'll disagree on every single item, but I want to be careful about the evaluation of their original proposals. Oracle believes the best way forward is for Judge Alsup to rule on "fair use", which would take care of the unanswered question without needing a new jury ("Presenting the case to a second jury would be expensive, time-consuming, and duplicative, and may impose a substantial additional delay."). "Google therefore requests that the Court declare a mistrial, and order a new trial, as to both infringement and fair use as to Oracle's claim that Google is liable for infringement of its copyright on the structure, sequence, and organization of the 37 API packages." "[Oracle's] first, and simplest, proposal is that the parties stipulate, if the Court agrees, that the Court will decide the issue of fair use with respect to Google's infringement of the Sun API specifications as the trier of fact." This would be a consensus-based way forward. The judge and the parties would agree. Google might not want to do this because it would lose the opportunity to challenge on appeal the fact that the judge answered Question 1B. Google's motion doesn't explicitly oppose the possibility of the judge completing the form but almost touches on it where Google quotes from the Seventh Amendment that "the right of trial by jury shall be preserved, and no fact tried by a jury, shall be otherwise re-examined in any Court of the United States, than according to the rules of the common law". Even that citation doesn't formally oppose the idea of Judge Alsup taking care of Question 1B: "the rules of the common law" allow judgment as a matter of law (JMOL). Google itself has requested JMOL on a number of issues. And back in the summer, Google brought a motion for summary judgment on copyright in which it also wanted the judge to rule on "fair use". Google lost and hasn't tried again, but the fact of the matter is that both parties, at different times, took the position that "fair use" can be decided by the judge without a jury. "If Google is not prepared to stipulate to the Court as trier of fact resolving the single issue of fair use, [Oracle] would propose that the parties waive the jury on all remaining issues (except to whatever extent the Court believed it was appropriate to retain the jury as an advisory jury)." By the "remaining" issues, Oracle doesn't mean the patent part of the case, but in Phase Three (remedies), copyright damages and infringer's profits (including, potentially, for rangeCheck) will come up. In connection with its first proposal, Oracle said it "would be prepared to abandon its claim for infringer's profits with respect to rangeCheck, and to stipulate that the Court could, based on the existing record, set the statutory damages for rangeCheck". Oracle explained that either there is fair use, in which case the jury wouldn't have to deal with copyright damages at all in Phase Three, or there isn't, in which case "the jury would have a single set of remedy issues relating to the API specifications". Under this second proposal (under which the parties would waive the jury on the remaining issues), "the necessity of a substantial trial of any copyright issues" would go away, too, and the judge could "deal with whatever allocation issues arise as the result of Oracle's damages and infringer's profits claims". 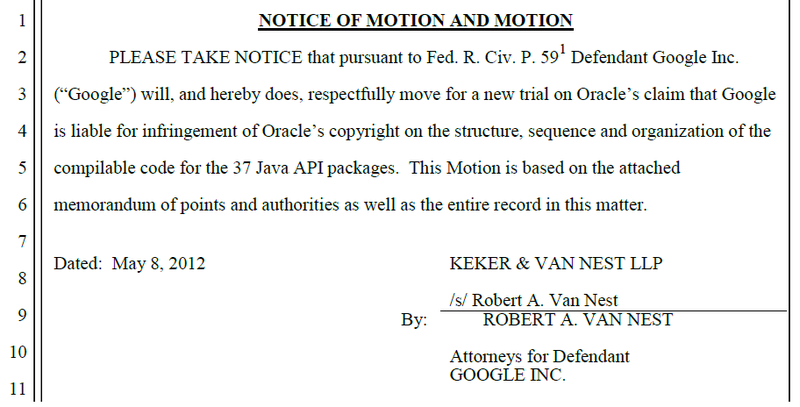 "If Google is not prepared to stipulate to either of these proposals, [Oracle] would propose to wait until the Court resolves Oracle's pending JMOL motion with respect to the fair use issue. Whichever way the court decides the JMOL motion, [Oracle] would be prepared to stipulate that the Court could resolve Oracle's remedy claims with respect to rangeCheck as a trier of fact." This third proposal also comes down to the judge resolving legal issues rather than making immediate arrangements for a new jury trial. The interesting thing about rangeCheck is that the related infringement finding constitutes a necessity to deal with copyright in Phase Three one way or the other. Oracle doesn't insist on putting the copyright infringer's profits issue before the jury (again, this can be done by the judge himself), but it cites case law that clearly entitles it to a disgorgement. In other words, rangeCheck is a pawn on the procedural chessboard, but the effect it can have on the further course of action is huge no matter how small a nine-line segment of program code is. Oracle's rangeCheck argument is largely based on the fact that the importance of a piece of stolen program code is not just a matter of its length but also of the technical role it plays ("the function was called 2,600 times just in powering on the device or starting the emulator: 'a pretty big number for the number of calls to this function. '"), and at any rate, the way to avoid dealing with infringer's profits is to rule that something is "de minimis" (which is a total defense to infringement), but if something is not "de minimis" (and the jury decided that rangeCheck indeed is not), the infringer still has the burden of proof for all of the deductions he wants to make from the income he generated with the infringing material. For example, Oracle's filing cites Cream Records, Inc. v. Joseph Schlitz Brewing Co., a case in which "the defendant copied ten notes from a song, 'The Theme From Shaft,' and used those ten notes without permission in a beer commercial". I guess Oracle is interested in addressing the issue of disgorgement of copyright infringer's profit because even in a scenario in which Judge Alsup's court didn't ultimately find Google to be liable for the identified infringement of those 37 Java APIs, things could change because of an appeal, and then Oracle wants to have a complete record with respect to Google's claimed deductions in order to avoid having to organize a new trial only to deal with the related issues. So far, Oracle hasn't commented on Google's claim that Questions 1A and 1B are part of one "indivisible" question. If Oracle disagrees on indivisibility, it will have to state its position in its response to Google's motion, just like Google will now have to take a position on Oracle's different proposals, all of which come down to the judge resolving "fair use" without putting the issue before a jury. Of course, if the judge ruled against copyrightability, a finding against Google's "fair use" defense still wouldn't result in liability for Google. It's unclear in which order the judge would resolve these issues. But he will have to rule on the parties' motions for JMOL. In my opinion, there's no reason why Judge Alsup couldn't decide on "fair use", and I can't see any other outcome than a ruling that Android's hijacking of Java does not constitute "fair use". As I said before, both parties asked for JMOL on this one at different times (Google lost once but can try again). The facts are pretty clear -- even if viewed in the light most favorable to Google, they fall far short of what constitutes fair use even according to the cases Google itself cites.